Assorted vegetables combined with generous pasta. Ideal for followers of a vegetarian diet. Freeze dried meal. 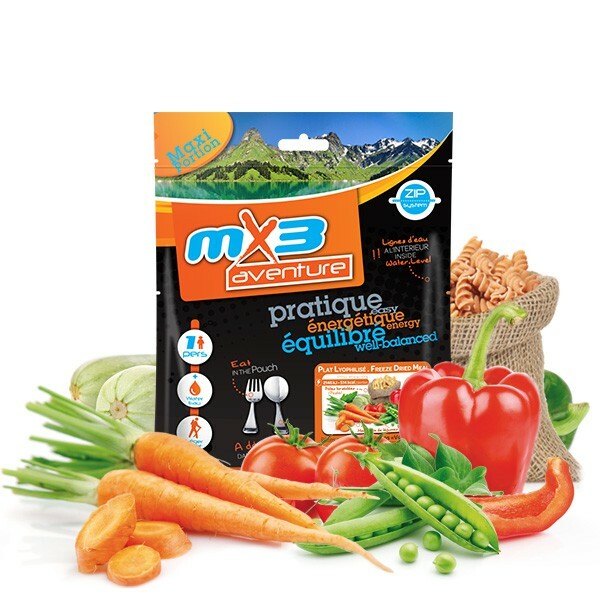 Vegetable and Pasta "Vegetarian" MX3 is the result of a mixture of various vegetables (zucchini, bell pepper, green bean-weight small-tomato-carrot) associated with appetizing pasta. Put hot water directly into the bag. Mix well, close the bag and let stand 10 to 15 minutes. Precooked pasta 65 % (wheat), vegetables (13,8 %) (tomato, carrot, zucchini, red and green peppers, French bean, pea), vegetable palm oil (lactose (milk) and milk proteins), herbs (4,1%) (onion, parsley, chive), salt, flavours (wheat, barlet, celery), natural flavour of turmeric.